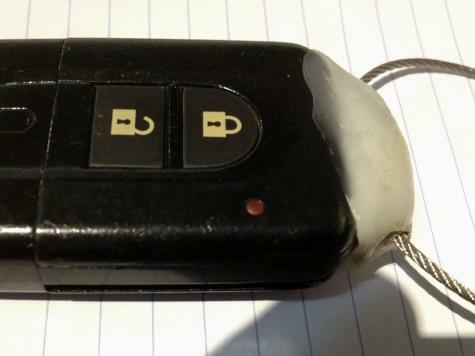 I originally intended to make a “cage” that was wrapped around the key fob, but when I noticed how good it adhered to the key fob plastic I just stuck a blob on the end and massaged it around the plastic nubs left behind from the original broken part. A skewer made the hole once it firmed up a little and the wire keyring finished the job nicely. It has been 3 weeks and doesn't look like failing.